Some albums are just albums. Merely a collection of songs that an artist was inspired to write during a certain period of their life. 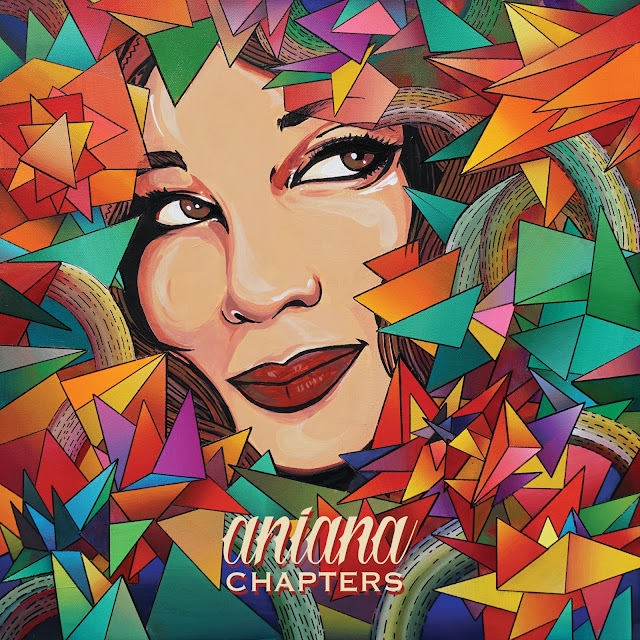 Portland, Oregon’s fiery, soulful neo-diva, Aniana, challenges that notion with her debut album, Chapters. Written in chronological order, both lyrically and stylistically, Chapters spans the entirety of Aniana’s adult life. From playing with reggae and hip-hop bands in Phoenix to the funk, soul, and rock & roll she’s become known for in Portland, all genres are represented in the album and symbolize her turbulent yet triumphant journey through life. The album begins with the title track, “Chapters,” which acts as a preface to the album’s story. “Been up and down this road a thousand times. I ain’t got no regrets and I’ve still got love for the journey,” she sings as a three-piece horn sections comes in and leads the listener into her most infectious chorus of the album, backed vocally by Kellen Asebrook (Fruition) and Chris Couch (World’s Finest). After the dark and edgy rock & roll tune, “Degenerate,” comes “Off My Back”, her solution to the track prior. Written about her leaving Phoenix “before the weight breaks her down,” the song feels hopeful in spite of it’s dark subject matter. Mimi Naja (Fruition) adds mandolin and backing vocals, the former of which blends perfectly with Brett McConnell’s smooth sound on lap steel. “Journey Dub” segues out of “Off My Back” and is one of the best examples of the outstanding production on this album. The vocals and instruments sound authentic and the whole track possesses a slightly electronic, atmospheric vibe that does more than emulate dub. It inspires beyond the genre. McConnell’s bass and melodica are the stars of this one, even teasing the following song “Rivers” with the latter instrument. At some point during “Rivers” you will begin to realize how perfectly Aniana’s voice meshes with reggae instrumentation. Yes, even better than the soul influences you’ve heard until now. “Don’t be a fool for no fairy tales,” she warns in this song about choices. The irie vibes continue with “Rootz,” a song that expands into spaced-out, playful psychedelia toward the end and “Burnin’,” perhaps my favorite song on the album. Her angsty edge returns on this anti-establishment tune ripe with horn harmonies and a melty-but-groovy keyboard solo from Dave Dernovsek. The most unique and intriguing song on the album is “crAZy,” a song Anina says was written at a time in her life so dark that she couldn’t express it through words, only tones. Repeating the lyric “crazy” throughout the song, it switches from a capella to a hip-hop banger, into a tribal drum breakdown at the hands of Nick Werth, and then back to hip-hop again. “Space Cowboy,” or “Mi Vaquero Del Espacio,” begins in spanish before exploding into a funk groove. Dernovsek shines again here, using the organ as his weapon of choice this time around, but it’s really saxophonist Marc Hutchinson who steals the show on his tenor with the best solo on the album. The final chapter is a song Aniana wrote about the “space cowboy” she eventually found, her multi-instrumentalist husband, Brett McConnell. “Always the One” was first performed for McConnell on a beach in Hawaii the day he eventually proposed to her, hence the stripped down acoustic sound and waves crashing in the background. Almost sounds made up, right? Turns out there was no need for her to chase those fairy tales after all, she was already on her way to living one.